The Chinese Crested dog breed was created to be an invalid’s companion. In that setting, you won’t find a better dog. They can almost read your mind and will lie in bed for hours without moving a muscle. They have almost no desire to go out and run around like regular dogs, although they are athletic enough to jump surprisingly tall fences and compete in agility. Chinese Cresteds are not gregarious, but they are intensely social and bond quickly within their pack. They don’t accept strangers easily. Once it falls in love with you, you’ll have a little stalker on your hands — he’ll be eternally, thoroughly devoted. See below for complete Chinese Crested characteristics! The Chinese Crested is an exotic-looking small dog who does not actually hail from China. He's found in two variants: the Hairless, with silky hair on the head (the crest), tail (plume), and feet (socks); and the genetically recessive Powderpuff, who has a full coat. Both variants can be found in a single litter. Regardless of variation, the Crested is a slender, finely boned dog who is elegant and graceful. He's a beauty, although he tends to win Ugly Dog Contests more often than other competitors. He's your basic big dog in a small, sometimes naked-looking body. Dog books often describe the Chinese Crested as highly friendly, but that's actually the exception rather than the rule. Yes, he's highly likely to smile at you when he's been naughty, but that's not quite the same thing. He's likely to be extremely sensitive and reactive, and he has a high social drive, all of which makes him needy. (Expect yours to sleep under the covers with you.) He can be wonderful with familiar people, but he's likely to bite strangers unless he's been well socialized and trained to refrain from this impulse. Contrary to popular opinion, the Hairless does not need to wear sun block, moisturizing lotion, or any other substance applied to the skin at any time; often that just causes problems. The skin has a better chance of staying healthy if nothing is put on it. Cresteds do need to be bathed regularly, however, every one or two weeks. Many of the Hairless types actually have a lot of body hair. Unsurprisingly, most people aren't prepared for how hairy a Hairless can be, and it can be an issue for allergy sufferers. These dogs aren't hypoallergenic; they're just low shedders compared to other breeds — but still, they shed more than you'd think a "hairless" dog would. And even the Hairless has noticeable hair on his head, legs, and tail. Some allergic people are fine with the Hairless variety, while others have no tolerance. This body hair must be kept shaved to keep the skin healthy. Letting it grow out is often excused as a way to keep the dog warm, but the long coat doesn't perform this function and instead triggers skin problems (sweaters are a better option for warmth). The Crested doesn't sweat through his skin, and he has the same body temperature as any other breed. Some are prone to a canine equivalent of acne, however. The Hairless Crested is incredibly, unbelievably tolerant of heat. He can lie in 100-degree sun for hours, like a lounge lizard, with no problems. He rarely pants and drinks very little water, which is pretty disconcerting for experienced dog owners who leave lots of water out. Conversely, he has absolutely no tolerance for cold. Some people try to "harden" their Crested by exposing him to cold, as though he were a seedling. This is not only cruel, it doesn't work. Cold will kill this dog a lot faster than heat will. Take a cautious approach to vaccinations, cortisone drugs, and topical applications with this dog. Rabies shots often trigger reactions. Some Cresteds can have a terrible reaction to medications, including topical flea preventives. A conservative approach to drug therapy is safest, so don't use anything that is not actually necessary. 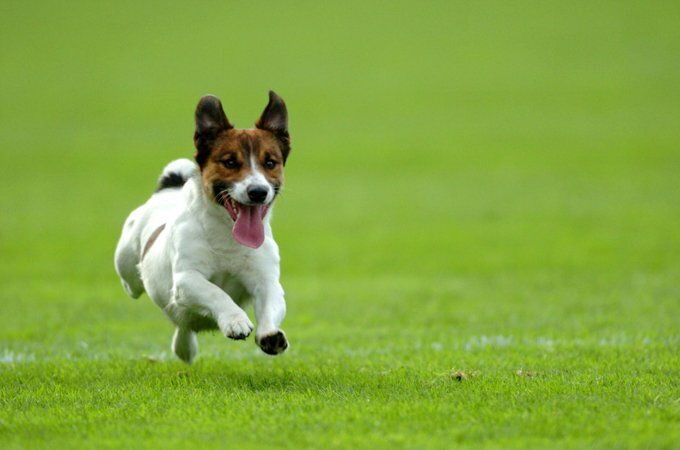 Normally, they don't need any flea or tick preventives — they are a last resort for fleas. Cresteds are wonderful family dogs who love to be with the people in their lives. They do well with children, although you should consider the age of the children and how they interact with dogs before bringing this small creature into your heart and home. They can be hurt easily and shouldn't be left unsupervised with children, or even alone out in the yard. With family members of any age who know how to handle dogs, however, they'll play games, affectionately cuddle up on the couch, and enjoy an active life. Because they're so social and needy, Cresteds can suffer from separation anxiety, which can lead to barking and destructive habits. They'll climb and dig to escape confinement if left on their own for too long. When you're around, they're comparatively quiet dogs, but they will alarm bark. They do well in apartments and any other type of dwelling. The Chinese Crested is a wonderful family dog who is playful, affectionate, and endearing. He's a stable companion who fills his owners' lives with love, laughter, and entertainment. Chinese Cresteds are adept at jumping, digging, and climbing. Don't make the common mistake of underestimating their athletic abilities just because they're small. They are Houdini Hounds who can escape from virtually any enclosure. A six-foot fence around the yard is a good idea; if they can get a grip on a fence, they're over it. They have absolutely no fear of climbing or jumping, and they can clear four feet from a standing position. Once they're out, they move fast and are — how shall we say this — averse to recapture. They are more stubborn than you are. Their athletic abilities are why many Chinese Cresteds are taking the conformation, obedience, and agility worlds by storm. Chinese traders once used the Chinese Crested as ratters on their ships, and they may have served this function in agricultural settings as well. Today they enjoy life as beloved family pets, but they also have the personality to excel at being more than just pampered pooches. Chinese Cresteds are a small breed suitable for many kinds of dwellings, including apartments. A genetic link exists between dominant hairlessness and missing teeth. It is not a sign of "bad breeding" but simply goes along with the breed. A Chinese Crested should not be left out in the yard alone or be left off-leash on walks. Tiny as he is, large dogs could view him as prey. He can easily escape through fences, and he can jump even high ones. Although Chinese Cresteds do well with children, the age and personality of the children should be taken under consideration before getting a one of these dogs. They can be hurt easily because of their tiny size. The fact that he's an exotic-looking dog might draw you to a Chinese Crested, but understand that they can be as temperamental as the next dog — and more so than some breeds. They have a stubborn streak. Chinese Cresteds will bark and behave like miniature guard dogs. If you want a quieter breed, look elsewhere. Chinese Cresteds are companion dogs and prefer to be with their owners and families. They cannot be left outside alone and will climb and dig to escape confinement if separated from their owners. They can also suffer from separation anxiety, which may make them destructive when they're left alone for too long. Proper socialization is necessary for the Chinese Crested since they can become timid and fearful of people. Chinese Cresteds are relatively clean and are low- to nonshedders. Chinese Crested dogs don't really come from China. They evolved from African or Mexican (no one is certain which) hairless dogs who were reduced in size by the Chinese. It's unclear when the breed officially arrived in North America, but the first breed club here was founded in 1974. In China, the breed has become rare. 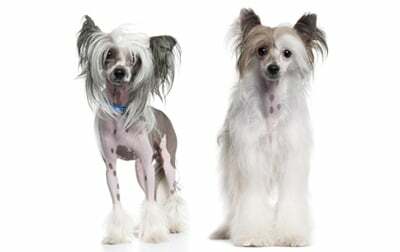 The average height for a Chinese Crested is between 11 to 13 inches for both sexes. They generally weigh up to 12 pounds. Alert and happy, the Crested adores and dotes on his people. Expect kisses and lots of snuggle time in your lap from this happy, loving little guy. Understand that he doesn't accept strangers easily — but once he comes to love you, you become his world. He makes an excellent companion and is extremely intelligent. Be aware, however, that many dog trainers unfairly rate them low on the intelligence scale because they don't fit the typical dog personality profile. The Crested is not a good breed for insensitive trainers. The Chinese Crested can be stubborn. Intensely social, he bonds tightly to his immediate pack. Really friendly Cresteds are the exception rather than the rule, as most are naturally suspicious of strangers. He can be reactive, and that trait combined with his high social drive tends to make him needy. He's wonderful with familiar people but likely to bite strangers unless socialized and trained out of that impulse. He'll alert bark to protect his home (not that the burglar is going to be terrified). He isn't particularly yappy, but he is adamant about his guard duty and will do his job. Some also like to howl or sing. Like every dog, the Crested needs early socialization — exposure to many different people, sights, sounds, and experiences — when they're young. Socialization helps ensure that your Crested puppy grows up to be a well-rounded dog. Cresteds are generally healthy, but like all breeds, they're prone to certain health conditions. Not all Cresteds will get any or all of these diseases, but it's important to be aware of them if you're considering this breed. In Cresteds, you should expect to see health clearances from the Orthopedic Foundation for Animals (OFA) for hip dysplasia (with a score of fair or better), elbow dysplasia, hypothyroidism, and von Willebrand's disease; from Auburn University for thrombopathia; and from the Canine Eye Registry Foundation (CERF) certifying that eyes are normal. You can confirm health clearances by checking the OFA web site (offa.org). Dental Issues: These tend to crop up due to a genetic link that exists between dominant hairlessness and missing teeth. The Hairless Crested has small, peglike teeth that can slope toward the front of the mouth and cause problems; the Powderpuff has normal toy breed dentition. The Hairless often lose many teeth by the tender age of two or three. Some Hairless require canned food, while others eat kibble with no problem, as does the Powderpuff. Legg-Calve-Perthes Disease: This condition involves the hip joint. If your Crested has Legg-Perthes, the blood supply to the head of the femur (the large rear leg bone) is decreased, and the head of the femur that connects to the pelvis begins to disintegrate. The first symptoms, limping and atrophy of the leg muscle, usually occur when puppies are four to six months old. Surgery can correct the condition, usually resulting in a pain-free puppy. Keratoconjunctivitis Sicca: Known as "dry eye," it's exactly what the name implies: an inflammation and dry eye. It occurs when there's a deficiency in the water portion of the tear film. The eye becomes dry and the membranes are left with only oil and mucus. The symptoms can be mistaken for conjunctivitis, which also has a gooey yellow discharge. Diagnosis is done with a Schirmer Tear Test. Treatment usually consists of eyedrops and ointment. A Chinese Crested needs only minimal exercise — he is not a good jogging companion — but mental stimulation is important. There are many toys and puzzles designed for dogs on the market, and he can enjoy many of them. Chinese Cresteds are generally easy to train but they have a stubborn streak, which means you need patience. Positive reinforcement is the only route, and correction needs to be handled sensitively, because the breed can be naturally timid. Socialization is necessary, so if possible find a place that offers separate small-dog puppy classes, so your Crested can socialize with similarly sized dogs. He could be injured while playing with a larger puppy. Crate training benefits every dog and is a kind way to ensure that your Crested doesn't have accidents in the house or get into things he shouldn't. A crate is also a place where he can retreat for a nap. Crate training at a young age will help your Crested accept confinement if he ever needs to be boarded or hospitalized. Never stick your Chinese Crested in a crate all day long, however. It's not a jail, and he shouldn't spend more than a few hours at a time in it except when he's sleeping at night. He's a people dog, and he isn't meant to spend his life locked up in a crate or kennel. Crate training is also helpful for housetraining, which can be one difficult area of training for the Chinese Crested (as a group, toy breeds can be tough to housetrain) — but it will all click into place eventually. Keep your Crested in good shape by measuring his food and feeding him twice a day rather than leaving food out all the time. If you're unsure whether he's overweight, give him the eye test and the hands-on test. For more on feeding your Crested, see our guidelines for buying the right food, feeding your puppy, and feeding your adult dog. Powderpuff coats are seen in all colors and in combinations of mahogany, blue, lavender, or copper. They can be solid or spotted. The skin tones of the Hairless are pink and black. Perhaps it's the Hairless's essential nakedness that made stripper Gypsy Rose Lee a breeder. The Hairless Chinese Crested is bald except for soft, flowing hair on the head, feet, and tail. Hair on the body should be shaved to protect the skin. Don't use sun block or moisturizers; let the skin remain natural. The Hairless should be bathed frequently with a high-quality shampoo. Because he can be prone to minor skin problems, such as acne, check for any blackheads while grooming. Powderpuff Cresteds are a lot of work to groom. They have a silky double coat, and the undercoat is copious and will mat if the dog isn't groomed regularly. Shaving the face is an option. The Powderpuff needs to be brushed weekly, except when the puppy hair is changing into adult hair, during which brushing is best done on a daily basis. A pin or bristle brush is best. All mats should be worked out and any "felting" between the pads on the feet should be removed. Powderpuffs should be bathed regularly but not as frequently as the Hairless, and they need a high-quality shampoo to avoid stripping necessary oils from the hair and skin. The dog should be towelled off and blow-dried (on a very low temperature) to prevent him from getting chilled or his coat from getting over dried. Start grooming your Crested at a young age. Grooming allows you the opportunity to bond with your puppy as well as check for any signs of illness that your dog may be showing. Make grooming a positive experience and you will find that veterinary checkups and grooming sessions when the dog has reached maturity will be easy and enjoyable tasks. Most grooming services are available at the local pet groomer's, and if you're unsure or wary about doing any of it yourself, especially shaving, you should seek the help of a professional. Both varieties can have dental issues, but the Hairless is particularly prone. Brush his teeth at least two or three times a week to remove tartar buildup and the bacteria that lurk inside it. Daily brushing is even better if you want to prevent gum disease and bad breath. Begin accustoming your Crested to being brushed and examined when he's a puppy. Handle his paws frequently — dogs are touchy about their feet — and look inside his mouth. Make grooming a positive experience filled with praise and rewards, and you'll lay the groundwork for easy veterinary exams and other handling when he's an adult. Sweet, gentle children are adored by Chinese Crested. Children need to be old enough to understand that they must be careful with these small dogs. Cresteds love other pets and are playful with them. Chinese Cresteds are often purchased without any clear understanding of what goes into owning one. There are many Chinese Cresteds in need of adoption and or fostering. There are a number of rescues that we have not listed. If you don't see a rescue listed for your area, contact the national breed club or a local breed club and they can point you toward a Crested rescue. Delaware Valley Chinese Crested Club, Inc.
Below are breed clubs, organizations, and associations where you can find additional information about the Chinese Crested.